Got a daughter aged 8+ who loves crafts? Description: Spark your aspiring artist's creativity with a fabulous DIY kit featuring a jewelry box, wall art and markers for a decorative chalkboard effect without the mess! When the designs are done, just use the included sponge to wipe away and start the art process over again. 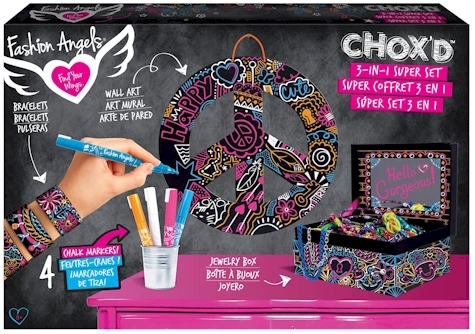 21 1/4"W x 3"D x 14"D.
Includes jewelry box, peace wall art sign, three bangle bracelets, four Chox'd markers, sponge and instructions.